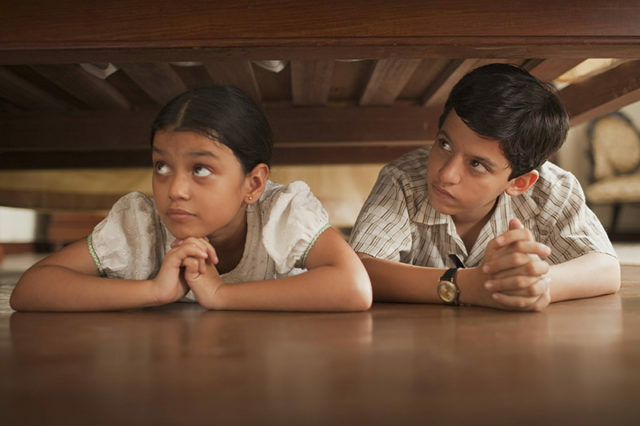 Left to right: Young Jamila (Anshikaa Shrivastava) and Young Saleem (Darsheel Safary) Photo courtesy of Hamilton Mehta Productions. (November 2, 2012, Toronto, Ontario) – Impressive, ambitious, epic, sumptuous – all are excellent words to describe Deepa Mehta’s adaptation of Salman Rushdie’s Booker-winning, hugely popular novel, Midnight’s Children. So are tedious and episodic. Since Rushdie is listed as one of the executive producers, co-wrote the screenplay with Metha and provides the voice over as narrator, one can safely assume he approves of the final outcome. Which demonstrates, once again if need be, that being a great novelist is not the same thing as being a great screenwriter. Case in point. The film doesn’t begin properly until the central plot point – in a film full of plot points and coincidences worthy of Charles Dickens – occurs; to wit, the switching of two newborn babies, one rich, one poor, at the stroke of midnight, August 15, 1947 when India became independent from Britain. It takes place only after a long 45-minute set-up, with the prospect of another two hours to come. Screenwriting 101: get the audience hooked in the first 10-to-15 minutes or you risk losing them as time passes. 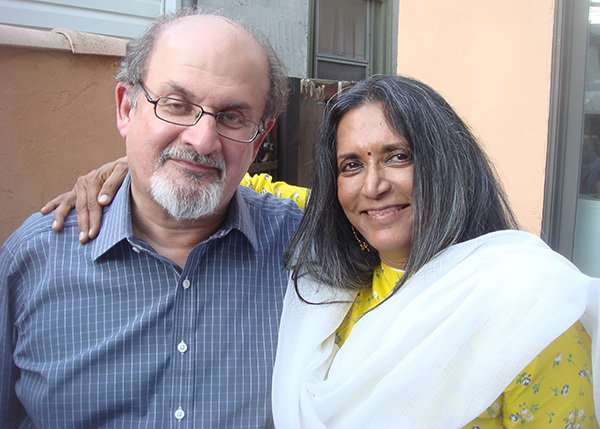 Writer Salman Rushdie with Director Deepa Mehta. Photo courtesy of Hamilton Mehta Productions. Epic in scope, the film covers 60 years of Indian history, from the colonial days of 1917 through independence, two wars with Pakistan and marshal law declared by Prime Minister Indira Gandhi in the mid-1970s. The focus is Saleem (Satya Bhabha, pictured below with Shriya Saran), the poor boy and his various “adopted” rich relatives. He posses a unique gift given to all the children – the midnight children of the title – born at the same minute of the same hour. He can communicate with them telepathically by wiggling his nose, and there are several scenes of him talking to their ghostly presence. Shiva, the rich child reduced to poverty becomes an early nemesis in these sessions, although it’s only later do they meet in person. All of midnight’s children appear in corporal form later in the film. Shiva and Saleem’s paths cross frequently, he becoming a feared member of Pakistani military and Saleem, through twisted fate, a penniless street performer in a snake charmer’s act. Left to Right: Parvati (Shriya Saran) and Saleem (Satya Bhabha). Photo courtesy of Hamilton Mehta Productions. The movie is gorgeous to look at, full of rich textures and lush greenery, and the acting strong throughout, especially Seema Biswa (the Genie-winning actress from Mehta’s Oscar-nominated Water) as the tendered-hearted Christian nurse who makes the switch, which she comes to regret, and goes to work as a nanny for the rich family to watch over Saleem’s well being. Unfortunately, she disappears in the second half, only to reappear at the very end, the true vision of Mother India. There is so much material to cover in Midnight’s Children, and so many stories to tell, that the drama gets lost along the way. Each episode is played out for all its emotional worth, but it’s soon forgotten as Rushdie and Mehta jump from scene to scene, decade to decade, and location to location (it was filmed in Colombo, Sri Lanka). What works on the page doesn’t necessarily work on the screen, and this faithful-to-a-fault adaption lacks any real cinematic juice. Despite the film’s scope, it feels set-bound and the extended early scenes with midnight’s children stop things cold, as the kids appear to be playacting ghosts in an amateur production. There’s too much exposition and too little real drama, which makes Midnight’s Children a bit of slog to sit through. Photos courtesy of Hamilton Mehta Productions. This review was written for Northernstars.ca by Wyndham Wise and is copyright © 2012. Wyndham Wise is Editor of Take One’s Essential Guide to Canadian Film and former editor-in-chief of Take One: Film in Canada. He is an occasional contributor to Northernstars.ca.